Many people consume coffee as a way to improve energy, mental focus, alertness and wakefulness in the morning. Caffeine in coffee can have these beneficial effects, but it can also increase levels of a stress hormone known as cortisol. Chronically high levels of cortisol can have a number of negative effects on the body. Consume coffee in moderation or drink decaffeinated coffee to limit cortisol levels. Cortisol helps convert fats and proteins into usable energy and acts as an anti-inflammatory agent. When the body is stressed, cortisol levels rise. While cortisol is a necessary hormone that plays important roles in the body, chronically high levels can trigger excess fat storage, which can lead to obesity. In addition, cortisol can cause cravings for sugar and increases in appetite. According to a study published in 2005 in "Psychosomatic Medicine," caffeine can increase cortisol levels in stressed individuals. The researchers set out to determine the effect of regular caffeine consumption on cortisol levels. The results of the study showed that after a five-day abstinence, reintroducing dietary caffeine caused a significant increase in cortisol levels. However, the overall cortisol response was significantly reduced after five days of caffeine consumption. The authors of the study concluded that the cortisol responses to caffeine can be diminished, but not eliminated, when caffeine is consumed daily. There is a strong relationship between elevated cortisol levels and obesity. In particular, cortisol may increase fat storage around the midsection. According to an article by Christine A. Maglione-Garves et al. on the University of New Mexico website, when the the body is exposed to chronically high levels of cortisol, the tissues can be altered, causing circulating fat to be deposited deep in the abdominal region. This can further lead to high blood pressure and elevated blood sugar levels, which increase the risk for cardiovascular disease and Type 2 diabetes. In addition to promoting excess fat storage, cortisol can have catabolic – muscle breakdown – effects on the body. According to a study published in 2008 in the "International Journal of Sport Nutrition and Exercise Metabolism," although high doses of caffeine may be able to slightly raise concentrations of testosterone, which has a muscle-building effect, during resistance training, it can also cause moderate increases in cortisol levels, resulting in a lower testosterone to cortisol ratio. This effect could potentially counteract any anabolic -- muscle building -- effects of caffeine combined with resistance training. Does Early Pregnancy Make You Disgusted by Coffee? Is Coffee Healthy for Teens? 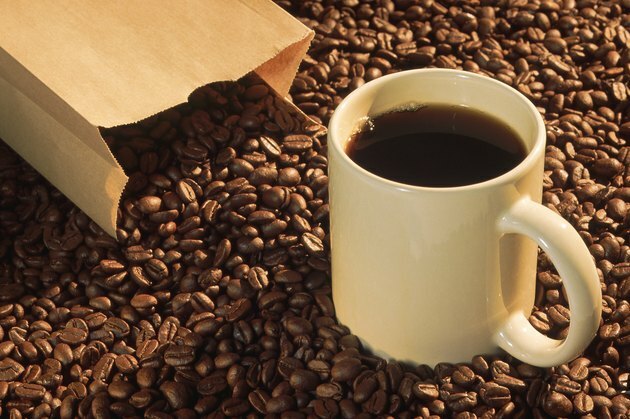 Can Drinking Coffee Cause Dry Mouth?